We have both climate- and non-climate-controlled units at affordable prices. Available 24/7, we can supply short- or long-term storage. We understand self-storage and best of all we help our customers understand their many self-storage options. Branch Crossing Storage features self-storage units designed to deliver worry-free solutions for both residential and commercial customers. Open to the public 24/7/365, our storage facilities feature many modern amenities to keep your items secure. We also have supplies for protecting and packing your valuables. If you're running out of space, contact Branch Crossing Storage today. A boat is a hefty investment, and off-season it should be stored to ensure it's protected. Digital cameras, on-site security, bright lighting, the finest computerized access and individual alarms make sure your boat is safe and ready when the time comes to get back in the water. Pricing is based on a number of factors, including length of boat. Branch Crossing Storage offers affordable boat storage rates. We have a series of parking services, both covered and uncovered. When it comes to storing your vehicle, Branch Cross Storage meets your needs. We use every resource available to protect your vehicle from everything from foul weather to vandalism. We can accommodate your car, SUV, truck, trailer or RV. If you're looking for the best facilities to store and park your vehicle or equipment, contact us at 866-264-5450 and visit with one of our experienced techs. Branch Crossing Storage provides affordable prices for all your storage needs. It doesn't matter if you're looking to store heavy equipment, oversized tool storage, self-storage or mini storage, outdoor or indoor vehicle storage, or commercial document storage, our facility will meet your needs. We also keep an extensive inventory of packing and storage materials to make moving your valuables safe and easy. We have boxes of varying sizes, packing and wrapping materials, as well as crating services. When it comes to providing quality service and storage, Branch Crossing Storage Center takes a back seat to no one. Founded in 2005 and headquartered in The Woodlands, Texas, we've built a reputation one client at a time, striving to provide a level of excellence considered unparalleled in our industry. We're constantly looking for improvements and adjustments that will make our facilities even better. 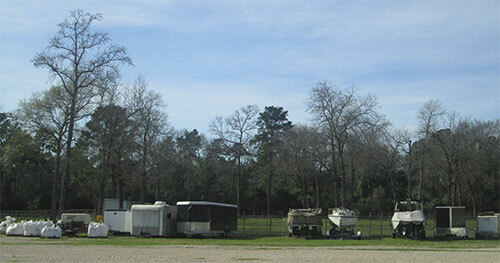 We have storage facilities that cover everything imaginable, including vehicles of any type or size, campers, RVs, trailers, boats, or construction machinery. Branch Crossing Storage will help you secure all of your storage needs. If you have office supplies, excess furnishings, inventory or documents that need to be properly stored, Branch Crossing Storage has the size unit to fit those needs also. If you're looking to put your wine or any liquor collection in a climate-controlled environment for safekeeping, we can help with that also. We have 24-hour access, 24-hour surveillance, covered and uncovered parking, indoor storage, lighted storage, liquor storage, ventilated storage, short- and long-term units of all sizes, easy-in and easy-out access via the latest coded technology, secure fencing, and more. Our units provide humidity protection. We have handicapped accessibility, pickup and delivery services, and we happily accept shipped packages during our normal business hours. We also sell any packing supplies you might need as well as portable units for making your move as simplified as possible. Don't hesitate to contact us to get answers. It's the best way for us to make sure you get all the information you'll need to make the project as stress-free as possible. We understand self-storage and we'll use that knowledge to help you look at the many options and select the best solutions for your specific needs. We are ready to provide you great storage units covering every type of storage situation imaginable and we are practically in your backyard. If you have a storage project and you want to get it done with no fuss and no muss, Branch Crossing Storage Center is the best alternative in The Woodlands and the surrounding community. Get in touch with us today! Give Branch Crossing Storage a call today and talk with one of our specialists who can help solve your storage needs.